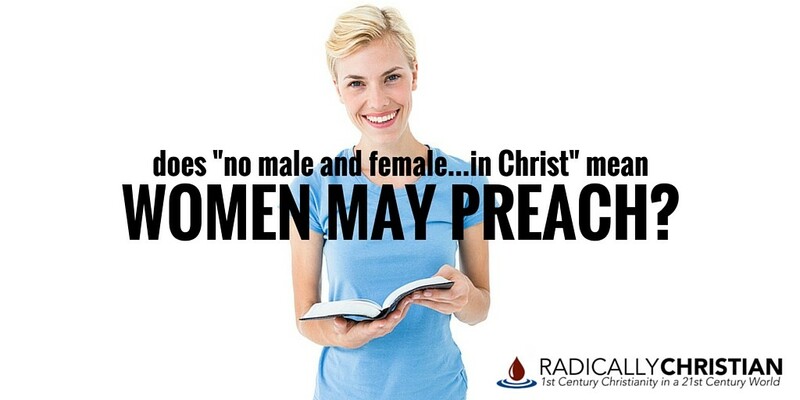 Does “No Male and Female…In Christ” Mean Women May Preach? There are several arguments people use to justify women in the pulpit, but one that’s frequently used is the argument from Galatians 3:28. The apostle Paul wrote, “There is neither Jew nor Greek, there is neither slave nor free, there is no male and female, for you are all one in Christ Jesus.” Many argue this passage proves there should be no gender role distinctions in the church and women ought to be allowed to preach in the assembly. Let’s discuss this passage and see if that is really what it means. After Adam and Eve ate the fruit in the Garden, God told Eve, her husband would “rule over” her (Genesis 3:16). Many argue that male leadership is simply a consequence of mankind’s Fall, not the way God wanted things to be. They believe Jesus’ death took away all of the consequences of the Fall and set things right, erasing distinct gender roles. They believe Galatians 3:28 proves this point. Admittedly, if someone simply read this verse out-of-context, it might be easy to see how he or she could come to this conclusion. What Was Paul Really Talking About? The apostle Paul wrote the book of Galatians to rebuke the heresy that if Gentiles wanted to be part of the family of God, they needed to be circumcised and keep the Law of Moses. In other words, the false teachers claimed Gentiles could not be justified in the sight of God unless they became proselyte Jews. Paul’s primary point in chapters 3 and 4 was: when someone responds in faith, being baptized into Christ – whether that person is a Jew, a Gentile, a slave, a freeman, a man, or a woman – he or she becomes an “heir.” And in order to be an “heir,” you had to be a son. Slaves were not heirs. Daughters were not heirs. Only sons were heirs. Paul is not talking about gender roles; in fact, his primary point isn’t even about gender, it’s about Jews and Gentiles. He is talking about the fact that those who seek to be justified by the Law of Moses are not God’s sons – they are not heirs – only those who have faith in Christ are heirs. But Aren’t Men and Women Equal in Christ? It is absolutely true that men and women have equal standing with God. But the fact that God calls men to lead is not an indication of woman’s inequality. When discussing how a Christian man should treat his wife, the apostle Peter wrote, “Show her honor as a fellow heir of the grace of life” (1 Peter 3:7). Peter made the same point Paul made, wives are fellow heirs with their husbands. As such, they should be shown “honor.” But that doesn’t mean Peter taught there was no distinction in roles. In the same context, Peter commends “holy women who hoped in God,” like Sarah, who “obeyed Abraham, calling him lord” (1 Peter 3:5-6). He encouraged Christian women to imitate Sarah’s example. Interestingly, Peter didn’t tell women, “But things are different now. The curse has been lifted. You don’t have to be in subjection any longer.” No, even as “fellow heirs,” women were still told to be in submission. What is the Application of the Phrase? Then how should Christians apply the phrase, “there is no male and female…in Christ”? First, we must keep it in the context in which it was written. We must remember that Paul is not talking about roles at all, but about the fact that we are all “heirs” in Christ. Secondly, we must not apply this in a way that contradicts other passages of Scripture, but must allow other passages to enrich our understanding. No one has to be circumcised, or follow the Law of Moses, in order to receive adoption as God’s sons (Galatians 3-4). Male Christians should treat their Christian sisters with respect and honor, because they are fellow heirs of the grace of life (1 Peter 3:7). What About Women’s Roles in the Church? In ministries that range from education to benevolence, Christian women all across the world are following in the footsteps of Phoebe, who was a faithful “servant of the church” and “patron of many” (Romans 16:1-2). These women are “fellow heirs” and their ministries are just as important as the work of any preacher, deacon, or elder. Christian wives are to submit to their husbands as the church submits to Christ (Ephesians 5). Even when Christians had miraculous gifts, women were told to show submission when exercising them (1 Corinthians 11:2-16) and they were not allowed to exercise speaking gifts in the assembly (1 Corinthians 14:26-40). Christian women were told to “learn in quietness and submission” (1 Timothy 2:11). Christian women were not permitted “to teach or to exercise authority over a man” (1 Timothy 2:12). This should NOT be scandalous or repulsive to Christians. All Christians have to practice submission. Submission is at the very heart of Christianity. Even Christ – the very Son of God – was submissive (see Philippians 2). We ought to celebrate and embrace submission, rather than trying to shirk it at every turn. Women are absolutely equal to men, but they do not have the same roles as men. My wife is equal with me, but we do not have the same roles. She is the wife, I am the husband. She is the mother, I am the father. 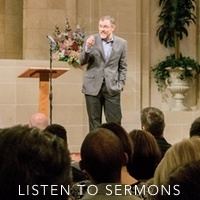 Our distinct roles – and even my headship of the family – are not indications of inequality, but of our mutual submission to the created order of things (see 1 Timothy 2:13). Twisting Galatians 3:28 to allow women to preach, shows disregard for the context of the passage and disregard to the rest of what Scripture says about women’s roles.